Low carb baked Scotch eggs are a traditional British party food that is low carb. Baked or fried, they will be a tasty lunch idea to pack in your picnic basket while you enjoy the fun times of summer with family and friends. Scotch eggs are a classic British picnic food. They can be served hot or cold, with dipping sauce, gravy, or just by themselves. Rumor has it that Scotch eggs were invented in London, but this dish’s inspiration comes from India and Pakistan. The centers can be hard boiled or soft boiled, depending on your preference. This British staple is traditionally fried, but my recipe bakes these scrummy morsels in the oven for a healthier version. If you aren’t from the U.K., you might be curious what exactly is a Scotch egg? It’s a boiled egg that is wrapped in sausage meat and then breaded. It is then fried or baked until the outside is a crispy golden brown and the pork is no longer pink. You might also be wondering, what do the British typically serve with Scotch eggs? Since they prefer to eat them for afternoon picnics, they pack up other British picnic food like salads, pâté, Scottish cheddar cheese and crackers, pickled onions, jammy dodgers, and tea. Enjoy these Scotch eggs along with millions of other British picnickers! I encourage you to try a traditional British picnic this summer you will be pleasantly surprised at how lovely British food is. If you liked this classic British picnic food, you may also like these recipes! 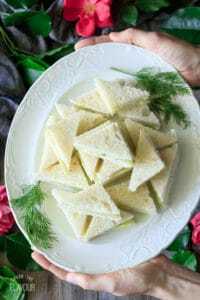 Easy Cucumber Sandwiches: refreshing, dainty morsels that will be a hit at a ladies’ tea. 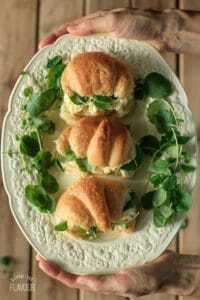 Classic Egg Salad Sandwiches: delightfully creamy egg salad on buttery croissants is always a favorite. 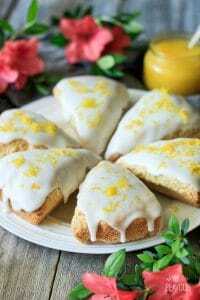 Easy Glazed Lemon Scones: a simple, yet elegant dessert that tastes fabulous with lemon curd. Put the eggs in a saucepan and cover them with 1 inch of salted water. Bring to a boil, then remove from the heat. Let the eggs cook for 9 minutes. Immediately drain and submerge the eggs in an ice bath for 5 minutes to stop the cooking. Peel the eggs as soon as they are cooled, as they will be easier to peel. Rinse off any tiny shells, pat dry, and set aside on a paper towel. In a large bowl, mix the ground pork and spices together with your hands. Set up three medium bowls: one for the flour, one for the beaten eggs, and one for the breadcrumbs. Divide the pork sausage into 10 equally-sized balls. Flour your hands, then coat one boiled egg in flour. Pick up a pork ball and flatten it in one hand. Carefully place the floured egg in the center and fold the sausage meat around the egg until it is completely concealed. Dip the sausage covered egg into the beaten egg, then coat it with breadcrumbs and place on a cookie sheet. Repeat until all 10 eggs are done. Bake in the oven for 35 to 40 minutes, or until the pork is no longer pink. Serve hot, cut in half lengthwise, with English mustard. If not eating immediately, let cool then cover and refrigerate. The scotch eggs can be served cold, cut in half. This recipe can be made the night before. The scotch eggs taste great cold, and also reheat nicely.